Korean auteur Bong Joon-ho (The Host, Snowpiercer) once again challenges convention with his latest brilliant film, Okja. It is a thoughtful, visceral satire of the corporate meat industry. The genius here is the delivery of the message. Okja uses the innocence and determination of a teenage girl as the vehicle for enlightenment. Her journey is indeed a profound one. Okja is a highly relevant critique of current methods, but also a guide to sustainable, humane farming. We take for granted the ease of our food supply. The production of cheap animal protein becomes difficult to stomach when we peek behind the curtains. Okja begins in 2007 at the New York City headquarters of Mirando Corporation, a global agricultural supplier. The bombastic new CEO, Nancy Mirando (Tilda Swinton), announces with great flourish the dawn of a revolution in the pork industry. Behold the super pig, a scientifically enhanced animal created from a unique Central American ancestor. Ten piglets are sent to ten farmers around the world. They will use their homegrown, organic farming techniques to raise the super pig. In ten years time, Mirando will award the best super pig a grand prize, then bring it back to America for mass production. One of those little piggies was sent to a mountain farm in South Korea. Under the love and care of the precocious Mija (Ahn Seo-hyun), Okja grows to be the size of an elephant. Mija and Okja are inseparable. They play all day, then at night, Mija snuggles up to Okja's huge belly. Their idyllic life is interrupted by the arrival of Dr. Johnny Wilcox (Jake Gyllenhaal), a goofy TV personality and the corporate spokesman for Mirando Corp. He is blown away by the size and health of Okja. Mirando has their grand prize winner. Distracted by her grandfather, Mija returns home to discover that Mirando has repossessed Okja. She runs away from the farm on a mission. No one and nothing will stop her from getting her best friend back. Okja is a jarring story on many levels. There are childlike, wondrous moments that reinforce the bond between Mija and Okja. For example, Mija uses Okja to help her fish, but she only takes the big one for supper; throwing the little fish back in the water. The pair exists in harmony with the environment. Bong Joon-ho juxtaposes those scenes with the terrifying, grotesque animal plants and research labs. He also introduces other factions that want Okja for their own purpose. While their intentions may be noble, the tactics used certainly require scrutiny. The film ramps up violently in the second and third acts. What starts out as cute and heartwarming becomes disturbing. Okja, the super pig, is portrayed in a sophisticated, realistic way. She is primarily CGI, but not cartoonish or anthropomorphized. 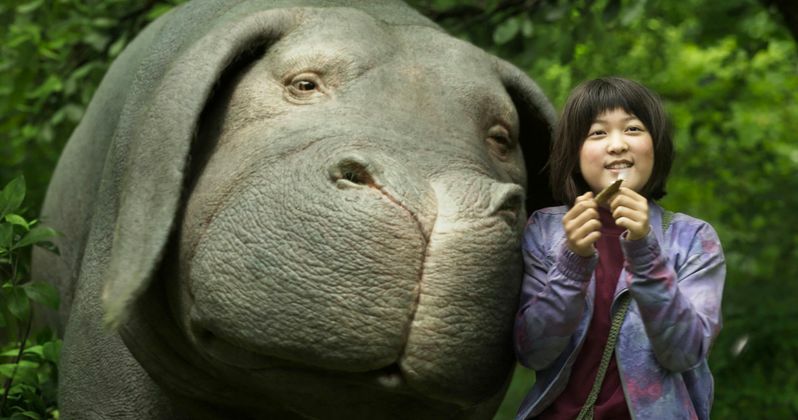 Okja is an animal, a beloved pet with intelligence and feelings. She is akin to your family's dog or cat, a treasured part of life. Bong Joon-ho wants his audience to see her as such, not a pork chop or plate of ribs. He straddles this line with deft aplomb. Mija and her grandfather are meat eaters. But they treat animals with respect. This is in direct contrast to the horrifying cruelty of Mirando, where maximum profit is the bottom line. Okja has excellent performances across the board. Ahn Seo-hyun, who plays Mija, absolutely owns this film. She is a force of willpower and determination. I think every youngster who sees Okja will identify with her. Tilda Swinton, who helped to produce Okja, and is a longtime collaborator with Bong Joon-ho, will have you laughing out loud. She has two roles in the film. The biggest surprise for me was Jake Gyllenhaal. Audiences have never seen him like Dr. Johnny. He is a caricature of animal TV hosts like Steve Irwin and Jack Hanna. It is a thoroughly repulsive character. Gyllenhaal continues to prove his immense versatility. Okja is a South Korean and American production. This means the film is in English and Korean. It will be streamed on Netflix in the west, but get a theater release in Asia. Bong Joon-ho has delivered an incredible, masterful film. Okja puts a face on the glaring issues of sustainable, humane food production. The meat industry will undoubtedly attack this film and its message. Audiences will decide if Okja makes a difference, or is just a film about a kid and her pet super pig. I can say, unequivocally, that Okja is the best original film from Netflix yet. It is a must see. Will Netflix's Okja Be This Summer's Stranger Things? Real-Life Sea Monster Washes Ashore in Indonesia, Is It an Alien?